The parish of Little Ellingham is northwest of Great Ellingham. The hamlet of Anchor Green is located in the south and there are a number of scattered farms, houses and industrial units. 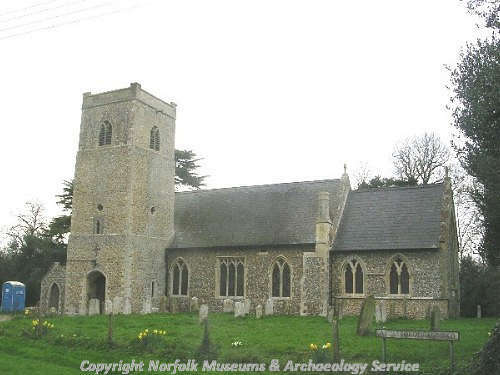 Little is known about the archaeology of the parish, mainly because little archaeological work has been carried out. A number of site visits have taken place, some sites have been identified on aerial photographs, a few objects have been found by chance and a few post medieval buildings survive, but there has been virtually no metal detecting or fieldwalking. All the recorded sites are located in the northwestern two thirds of the parish, with none recorded in the southeastern third. Hardly any artefacts dating to before the Norman Conquest of 1066 have been discovered. Five prehistoric objects have been recorded, a Neolithic flint axehead (NHER 2958), three Bronze Age copper alloy palstaves and a Late Iron Age brooch (NHER 34598). A brooch is the only definite Roman object, although a whetstone recovered in the west is either Roman or medieval. An iron spear found in the northeast may be Saxon or medieval. Little Ellingham is called ‘Ellingha’ in the Domesday Book of 1086. This Old English name means the ‘homestead of Ella’s or Eli’s people’. In 1086 King William I and William of Warenne held the land in the parish and villagers, smallholders, meadow, ploughs, woodland, pigs, cattle, sheep and goats were recorded. The first recorded use of the prefix ‘Little’ is in a document of 1242. St Peter’s Church (NHER 9109) is located in the village. The southwest tower and parts of the chancel date to the 13th and/or early 14th century. As much of the medieval building was destroyed during a fire in 1867, the rest of the existing structure dates to the subsequent rebuilding. To the north of the church is Rectory Cottage (NHER 29939). This was probably built in the late medieval period as a hall house, but only one end of this structure survives. Most of the existing building is 19th century and alterations were made during the 20th century. Medieval earthworks (NHER 29581), including a possible wood boundary, a pond and a possible toft, survive to the north of the village. Medieval pottery has been collected from the possible toft. In the northwest a medieval moated site, including two moats and an enclosure, is visible on aerial photographs. Some earthworks survived until 1960 and during the 19th century undated human bones were found in the area between the two moats. Relatively close by a possible moat (NHER 13060) and probable medieval tofts and field boundaries (NHER 33950) have been identified. Post medieval buildings include Glebe Cottage, the Old Rectory and Rookery Farmhouse. 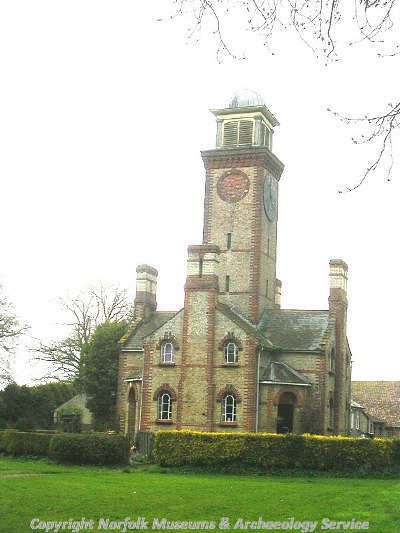 Little Ellingham Hall (NHER 9110) and its associated clock tower were both built in 1855 and are located in the village, northwest of the church. The only recorded post medieval object is a key recovered north of the Hall. Faden’s map of 1797 shows a kiln in the northwest. David Robertson, 10 May 2006. Knott, S., 2006. 'St Peter, Little Ellingham'. Available: http://www.norfolkchurches.co.uk/littleellingham/littleellingham.htm. Accessed: 10 May 2006.